I hope you all had lovely holiday seasons. I sure did. Believe it or not, I have done a lot of contemplating about writing in the last two months, though it hasn’t (yet) translated to more posts. A less hectic and draining year than 2012. A year with no major health setbacks: YAY! Learned the value of setting goals or resolutions for oneself. I did not set any for 2013 so by the end of the year, I didn’t feel as accomplished as I might have had I written some things down. Ergo, I came up with eleven goals/resolutions for 2014. Took up a new hobby: re-learning crochet and making amigurumi. Yeah, I had never heard that word before, either, but apparently the only way to refer to small, crocheted/knitted animals is through this word. Thank you, Japanese language! The adorable animals, the words “teeny tiny,” and the cursive font all sucked me in. Pretty cute, no? After exclaiming in my head how adorable these little creatures were, I immediately thought, “How hard can this be? I can make these.” It was probably more like, “I HAVE to make these!” But whatever. Problem was, I assumed that the book clearly stating that it’s “even for beginners” actually meant that it would give some verrrrrry step-by-step instructions for those taking up the hook for the first time or starting over again, as I was. I was laughably wrong. The book does attempt to teach you how to read a pattern, which is a learning process in and of itself, and through its photos, tries to get you to understand slip knots and rings and all that. 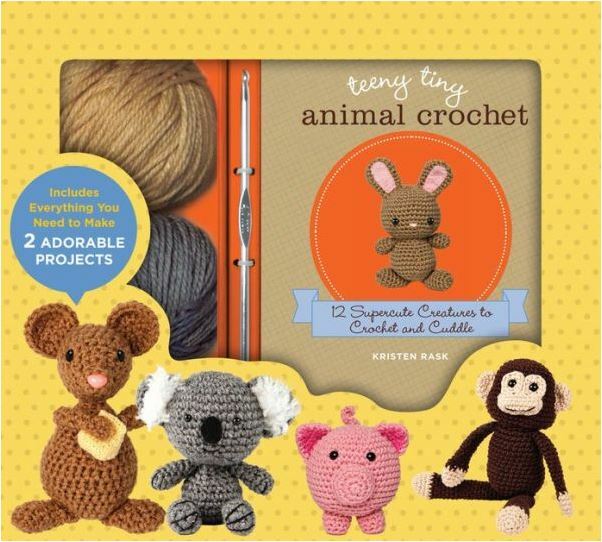 The kit also gives you two small balls of different yarn (not even a whole skein) and a few more supplies to make “two projects,” that of the bunny and the koala bear. I was immediately drawn to the bunny. I have an affinity for bunnies and couldn’t wait to try and replicate the project on the cover of the book. The koala bear was just “eh” to me; in fact, I really thought I’d be able to make two different bunnies with the yarn. If that notion were a crochet balloon, it didn’t merely pop–it was shot down. In addition to the photos in the book being largely unhelpful (not that photos can’t be helpful but this book shows the wrong part of the step to illustrate something, and what good does that do? ), the patterns are inconsistent in terms of how thorough they are. The book is a compilation of patterns from crocheters around the country. Perhaps there was only so much editing that was allowed. Moreover, the yarn hook that was provided had an eye way too small to thread the yarn that comes in the kit. So that was some fun time spent trying to get that to work. One of the patterns completely omits telling you to stuff the body parts, even though you need to. It also goes into ZERO detail on how to sew animal parts together, which is a pretty crucial part to making a successful stuffed animal together. It simply gives instructions like, “Sew the head onto the body.” Okay, HOW? What EXACTLY is the best way to do that? My dude can attest that there were a couple of times I simply sat and screamed at the book or my yarn in frustration, much to his consternation. In the end, I did not manage to complete a project with the given supplies. I was able to make three-quarters of one bunny and half of another. The balls of yarn ended up just being practice for me. The irregular bunnies are now my dog’s playthings. I stayed up late on weeknights as I tried to master this craft in a short amount of time, but until you crochet a few thousand stitches and really grasp some crucial concepts, it’s just not going to gel quickly. So for anyone reading this who wants to take up crochet, just remember to be patient. Don’t be like me and through sheer hubris, assume you’ll master this within a few hours. Or even a few days. There is a bright silver lining to this particular craft, and that is YouTube. YouTube gave me the much needed visuals in order to learn all the crucial basics, while other crochet bloggers out there wrote extensively on subjects like hook type and size, gauge (the G-word, in the crochet world; “Check your gauge!”), sewing (at last! ), and everything in between. 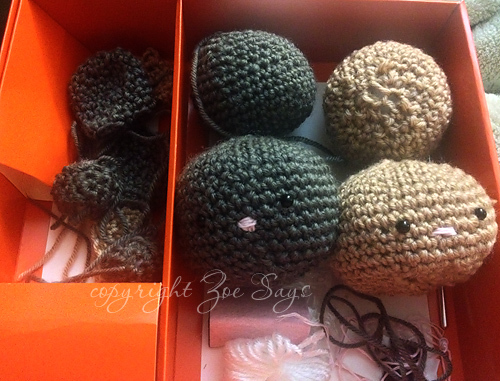 I managed to teach myself some crochet basics and what I needed to know for amigurumi through watching dozens of video tutorials from experienced crochet gurus out there on the world wide web. I also researched decent free patterns but also purchased a few from Etsy. I went to several craft stores before and after Christmas to stock up–and I really stocked up–and now have a small yarn store plus essential amigurumi supplies sitting in my living room, which has become my temporary craft room. Basically, between December 23 and now, I have had some very nice successes and also some really terrible project outcomes. I grant that I may have picked this up more quickly than some might, but I attribute that to my grandmother, God bless her, who taught me and some of my cousins at a young age the art of crochet. Back then, though, we were making potholders and little things like that. So my little crochet muscle memory lay dormant for a couple decades. At the bottom of this post are some photos of a few successfully made projects. And perhaps a photo or two of my Irregulars, as I’m calling them; those being projects that I either completed or had to abandon midway through due to irreparable screwed-up-ness. After posting several photos on my personal Facebook page, a handful of people told me I should open an Etsy shop. I sat on that idea for a couple of weeks and then thought, why not? One of my resolutions was to simply be more in the present moment, and what better way to carpe diem than to just to try something for the fun of it? I only have a few listings up but I will continue to add to it. Despite some initial setbacks, they did not deter me from having an all-consuming passion for crochet. In fact, I have to pace myself at it and force myself to take breaks and do other things so I can have a normal life, in addition to giving my hands and arm muscles a break. If you crochet enough, it will cause some serious joint pain and nearsightedness. Good times. I’d love to hear if any of you took up a new hobby so far in 2014 or are already experienced in the Ways of Yarn. More to come from my end, I can promise you that! « I Want a Valium for Thanksgiving, Charlie Brown. I would say the clam is my favorite. These are so cute Zoe! I love crocheting and taught myself shortly before baby #2 was born. (Mainly because I’m a cheap and didn’t want to fork out tons of money for photography props I could make myself 🙂 ). Thank you, Dayna! I know what you mean–being able to make things kind of rocks. I’ve never liked sewing but I’m becoming quite good at it. With yarn. Thanks for the link, too!